Bruce Norris’s comedy on race and rejection rises to delight and perfection in the hands of Altarena’s superb actors and crystalline directing by Daren A.C. Carrolo. “Clybourne Park” makes us laugh and makes us cry because he deals with “Otherness” in ways we can recognize. Inspired by Lorraine Hansberry’s “A Raisin in the Sun” (1959), Bruce Norris’s 2010 Pulitzer Prize winning play continues Hansberry’s story in this brilliant sequel. 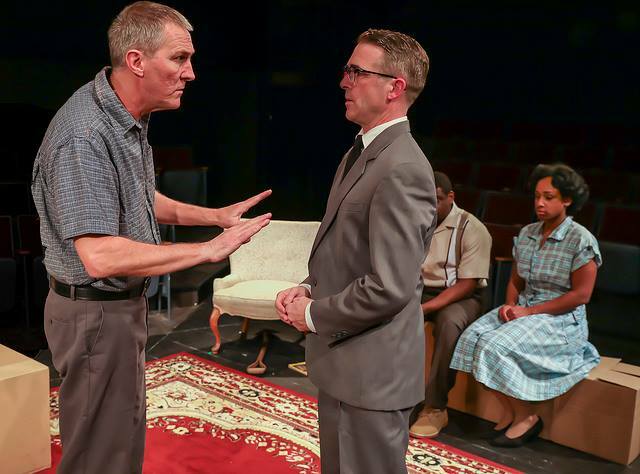 “Clybourne Park” deals with restrictive rules on housing on Chicago’s South Side—in 1959, and then, 50 years later, in 2009. In 1959, Russ (simmering Ted Barker) and Bev (bubbly Shay Oglesby-Smith), are packing to move. Mysteriously, they are alienated from their local friends and “community.” They are besieged by hilarious intruders, like anxiety-driven Karl (high-energy Steve Rhyne), who implores them to undo their house sale to a Black family. Cringe-worthy Karl scales up the tension in a wild and wooly confrontation. Barker, as the delightfully depressed Russ, compliments Shay Oglesby-Smith’s wonderfully chatty Bev, beautifully. Russ brashly warns off the minister (affable, intrusive Peter Budinger) from sensitive matters. But none of these neighbors can take a hint—forging ahead in front of their modest maid Francine (mesmerizing Champagne Hughes) and her helpful husband (impressive Khary L. Moye). What a carnival of delicious misunderstandings and embarrassments, full of searing wit and comedy. Hughes performs with perfect timing as Francine, submissive servant one moment, and self-assured woman the next. The whole ensemble works like finely tuned clockwork. Despite years of Francine’s working in her home, Bev maintains a strict distance between maid and mistress. “Clybourne Park” weaves a seamless quilt of deluded people, each involved in a rich mini-drama. The delightful second act takes place in the same house 50 years later, in 2009. Clybourne Park became a Black community, but now gentrifying whites are remodeling the same house. Lawyers and agents (the same characters transformed) huddle around the planning table. Hughes as Lena, a stylish professional, tries to voice her opinion—but the white folks still silence her. Only when Lena raises her voice is she heard. All their lives are transformed in 2009. Obnoxious Karl (hilarious Steve Rhyne) has turned into superficial Steve, still thwarting civil rights. Rhyne plays Steve’s ridiculous opinions with tremendous humor and wit. When Steve’s wife, serious and smart Lindsey (delightful Leslie Howard), tries to explain the devastation of growing up in a ghetto, she finds herself grasping for words that won’t make her sound racist or belittling. We want her to stop, to save herself, but Howard takes us on a comic ride to white folks Hell! The same self-satisfied gentrification of Clybourne Park is going on in San Francisco and Oakland and Brooklyn and Chicago. In Norris’s brilliant play, reincarnations of racism turn up 50 years later—and this ensemble makes it all strike home. Cast: Ted Barker, Peter Budinger, Leslie Howard, Champagne Hughes, Khary L. Moye, Shay Oglesby-Smith, and Steve Rhyne. Banner photo: Ted Barker, Steve Rhyne, Khary L. Moye, and Champagne Hughes. 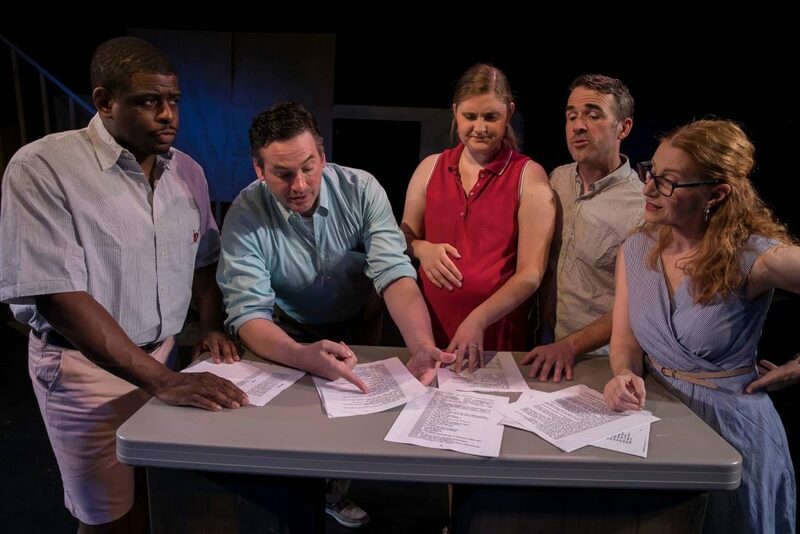 “Red Scare on Sunset” Hilariously Spoofs McCarthyism, at NCTC, S.F. “Sweat”—A Passionate Portrait of U.S. Workers, at ACT, S.F.